At the western end of Fedaia Pass, a dam overlooks Val di Fassa. Standing on the dam and looking down, if you blinked you’d miss the ice falls cascading down the Southern side of the valley below. But look more closely, especially from near Rifugio Castiglioni and you will see 4 streaks of ice. Furthermore there are others here and due to their high altitude, these stay in condition for far longer than some others. Conversely when it’s cold in the valley, here you will find the ice brittle and not much fun to climb on, so this venue is perfect later in the season when substantial ice has formed. Cascata della Galleria is easily accessed from Rifugio Castiglioni – just part by the hut and walk 10m! First climbed on a whim, and almost too ridiculous to include, it’s actually kind of fun and you can be on it in approximately 30 seconds, it will take all of a few minutes to climb and you’re back at the car in no time at all! The ice fall is actually a gutter from the roof of the gallery and forms a pillar in quite a stunning spot. Above there is an icefall which occasionally forms, I have no idea whether this has been climbed. If you know, please write to me and I can include it here. Access to routes 1, Das Schlusselloch and 2 is relatively easy, from the southern end of the dam. Drive over the dam and immediately on your right you will see a souvenir shop and bar, called Bar Diga. Park in the carpark at the back of the bar and then walk to the end of the carpark where you will find a marked path that descends into the valley, quite steeply to begin with. After about 5-10 minutes depending on conditions you will see the first icefalls on the left. If you continue beneath the cliff you will reach a deep twin gully which is the location of das Schlussellock and 2. If you have names for the routes, and a first ascensionist, please let me know! Route 1 WI 3+, 40m. This is the first route on the left and climbs a wide slab at its left most extreme. Start by climbing from a small cave directly up a short steep wall onto the slab, the ice may be quite tin here. Here you can either continue directly up steep steps, or trend slightly right but the smooth ice slab to a final wall. We climbed it in two pitches, but it should be possible to climb it in one given the right conditions and enough screws.n Finish at a pair of trees, to the left of a higher set of falls which form a slight curtain of ice. There are a number of other features to the right which we feel almost certainly have been climbed – please let me know if you have information. From Route 1 descend another 150m to find a deep twin gully which climbs towards an obvious streak of left trending ice. This route follows the first gully, on the left. 2: After climbing the boulder (may not exist after snow) you reach a wide open bowl, climb left to a thin streak of ice below a small tunnel in the rock. 4: Either descend from here or continue up snow for 50m to reach the aquaduct which crosses the mountainside. You can use the aquaduct to return to the dam. The original objective when climbing Das Schlusselloch was to see if we could connect to the obvious ice smear. At the time, the ice from this had not connected to the ground, but recently I went back and saw that it should be possible with good late season conditions to climb a fine look line which would give a fine route, with a steep first pitch, maybe WI4+? If you have climbed it please let me know! Access to routes 3&4 is best from Pian Trevisian, where you can park at a haripin in the road to Canazei or at Albergo Villeta Maria and walk into the valley. When there is snow, even after a warm spell it is likely that you will need snowshoes or skis as the snow stays cold and powdery for a long time here. When coming from Pian Trevisian, follow the path and after 1.5km, cross the valley to the southern side. In amongst the trees there are two parallel cascades, some 50m high. The cascade which we did not climb is a clear objective and starts from a terrace. It seems there would be substantial volumes of ice. The cascade to the right can be taken two different ways, on the left or the right. Start by a large open cave and climb an initial short steepening, either going left up a continuously steep cascade in one pitch to the top, or go to the right of a rock, then rejoin the fall higher up for a final steep section. This second line is what we climbed, finishing at a tree where we found a cord and Maillion and seemed to be easier than the lefthand line, which I would expect to be WI4/+. The Gran Poz is a large outcrop which hangs above the dam and is quite obvious and slabby. It is home to some easy rock slab climbs and some other lines which we know exist but have no information about. Again, if you know what these routes to the right are, please get in touch as we would be interested to publish a guide here! La Cometa di Bous has quite a long approach across a steep terrace. Take care when crossing as it is easy to slip here and when conditions are firm underfoot, it could end in a fatal slip, as has happened in the past. Park in the upper car park by the lift to Pian di Fiaconi. Walk up 20 yards and then head right across the ski piste to find a path through the trees and scrub. This leads up and west to the aforementioned terrace which steepens and narrows the further you go across until you are directly beneath the Gran Poz. Follow the cliff round for several hundred metres into am open bowl beneath Marmolada and you will see the large icefall of Cometa di Boes on the left. 1.5hrs Climb the icefall start on the left, slowly working up to finish on the right. Malga Ciapela is a beautiful spot. 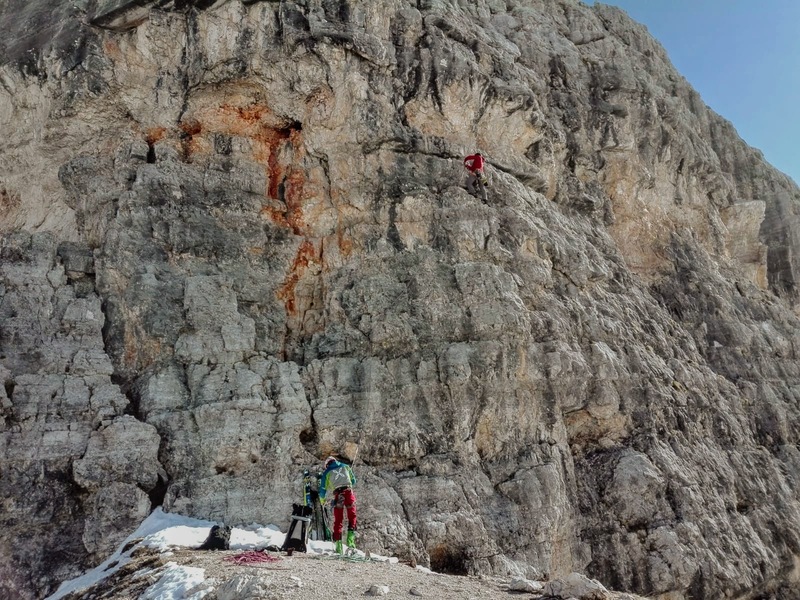 Currently it is dominated by the ski lift to Marmolada, but look carefully and here there lies some potential for ice climbing but also Dry Tooling. I will split this area into two sectors, west and east. The west side of the valley consists nearly entirely of very hard dry tooling, in the Tomorrows World cave, first climbed by Tom Ballard. On the east side, the climbs are easy ice climbs, ideal in the early season when it is cold, as they nearly all catch the sun in the afternoon for a while. This sector holds one of the highest concentration of drytooling routes in the world. First discovered by the alpinist Tom Ballard, the routes climb through the roof of a huge limestone cave. The holds are natural and the routes are generally long stamina fests. Park by Capanna Bill and cross the ski piste to the cave. The routes on the east side of the valley are located around Capan Bill. They follow natural water courses and under heavy snow would become impractical. But for the last few years when the start of the season has been snowless, they provide good sport and are useful for beginners as they have short pitches and are at maximum WI3. As they are a little higher than the gorge, they can be reasonably reliable in the early season when the sun barely touches them. They are very close to the road so you can easily find them and see what sort of condition they are in. Park in a small layby below Capanna Bill from where you will see three streambeds descending the hillside. The right hand most forms Minion. Walk up to where the stream splits in two and climb the streambed easily, with a couple of trickier steps no more than 4-5 mtres long. Take the left branch and bash through bushes a little to reach some more vertical ice. Take the obvious line of weakness, 25m. Then descend by either ascending the right bank of the gully and abseiling and down climbing from trees or possibly more sensibly, set an abalakov and abseil the last step and walk down the hill. Park in the layby near Capanna bill and walk up to the middle streambed. Currently you have to start by climbing up behind a fallen tree which provides some interest. Then continue up a stepped fall with one steep section around 10m high. Continue for another 1-2 pitches where you can then either abseil down from the right side of the gully or continue to the hillside above and walk around and down to the road. The third streambed often looks dirty and rotten from the sun and as yet I have not climbed it. A short free standing pillar high on the hillside above Capana Bill. Drive up the fist few hairpins of the pass until you reach a barrier on the right and some small cabins. Park here and take a track into a small re-entrant and then strike out left up to the falls. The climbing is brief at around 15m but kind of fun and in a nice location. Almost ice bouldering, and a good opportunity to climb a short vertical pillar for the first time. Descend the hill side. The Serrai di Sottuguda is a deep slash through the base of Val Pettorina formed during the ice ages as glacial meltwater gouged down through the rock. It is a UNESCO site, as is Marmolada which towers above the gorge to the west. So narrow in places that the walls almost meet, this natural phenomenon ticks every box you can think of as an ice climber. With a total of 29 routes in the guide book (and a bunch which aren’t! ), it’s a really extensive venue to visit. The valley which faces east-west is very deep, hidden from the sun through most of the winter and acts as a cold sink for air dropping from Marmolada’s glacial north face. With temperatures in November usually in the minus figures and water pouring into the 150m deep gorge from both sides of the valley, conditions couldn’t be more perfect for an ice climber. Please note – there is officially no current access allowed to the gorge. If you enter, you do so at your own risk, and also if caught may be taken to task by the Carabinieri. This is what makes the Serrai di Sottoguda so appealing – essentially roadside ice. The car park at the end of Sottoguda village is large and only occasionally full. From here take the small road which leads uphill into the gorge. Within 3 minutes from the car you will reach the first icefalls, and the far end of the gorge is a further 20 minute walk uphill. Alternatively you can park in Malga Ciapela and walk down into the gorge if you plan to climb higher up the valley. Over its 2km length, amongst its 29+ lines, the gorge has a great number of classic routes. I’ve decribed the canyon from it’s lowest end, nearest Sottoguda and in sections to make it a little clearer. Starting just after the gorge office building the gorge narrows. This is home to various shorter routes, both mixed and ice and finishes by the large cave with a Madonna in it. The first ice fall on the right as you enter the gorge from the village. Although short, it is worthwhile as a warm up or for beginners. The belay is equipped with bolts. El Dent del Guidizio WI5+/M5 15m. Just to the left of Baby, there is a cave. Climb the initial wall to this, then climb to the hanging ice with sections of M5. Descent is by abseil from the trees above. The climbs the wall opposite and slightly further up from Baby. It is short but hard with difficult protection as the ice forms very thinly over a slab. There is risk of a ground fall with the ground being the river below! Another short, extreme route with ground fall potential. The route starts just as the river disappears beneath the roadway and climbs a corner by a section of brutal looking mixed climbing. Higher it reaches a smear of ice which is climbed to the end of the route. 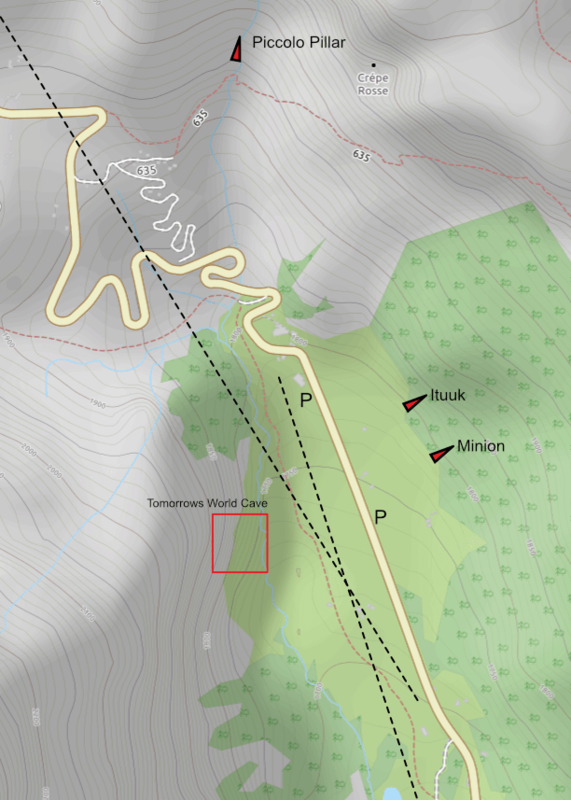 2 mixed/dry routes which are fully bolted exist on the right side of the gorge. Straight after the Madonna the gorge opens out into a large bowl, dominated by the fantastic Cascata del Sole on the right. Immediately on the right there is a line of bolts in a cave – currently I do not know what this line is, presumably either a summer line or an tough drytooling line, although the bolts look old. One of the few routes to receive full sunlight, this route comes with the usual caveat. However, choose an early morning ascent or a late afternoon time and you may just strike the right conditions. A massive volume of ice which funnels down to a narrow gap at its top. The access pitch climbs to a small cave with a bolted belay. You can either stop here or continue up the initial steep section to a bolted belay on the right. This is advisable for afternoon ascents as the second belay is far over to the right and out of the way of dripping water and falling ice. It also allows you to assess the condition of the upper falls which are slender at the best of times. This fall is partly hidden from view up in the woods more or less directly opposite Cascate del Sole. Start at the left of the falls and then climb up and right with some vertical steps. Descent is by abseil from the trees above. Not often in condition. The first pitch is often climbed in it’s own right. There are two lines above, one slightly harder than the other. However in recent years these have been slow to form fully. Climb a short free standing pillar to an easier ramp, usually covered with snow. Climb up to a tree (currently there is a tree which has fallen across the path making gaining the tree awkward. Eitherdescend from here or traverse rightwards to the step upper pitches. The line on the right is climbed at WI4, the one on the left 4+. Abseil from trees if possible as above there is steep, snowy ground which often is difficult to wade through. Immediately after the bowl the gorge pinches down into a very tall, narrow section with the road bridge going directly overhead. There is a high concentration of hard routes in this area, mainly on the left side of the gorge but also there are some dry routes on the right. This rare line climbs a huge hanging curtain of ice which descends from the buttress below the road over a large overhang. Climb to the cave formed by the curtain, belay and then very very carefully climb the curtain to reach more sucure graound above. A big tick. Nice climbing although a little broken with an easier middle section. The route which starts beneath the road bridge on the left hand side of the gorge. Jumping over the barriers allows access to a point at which the river goes beneath the gorge wall and affords an easy step across to the ice. 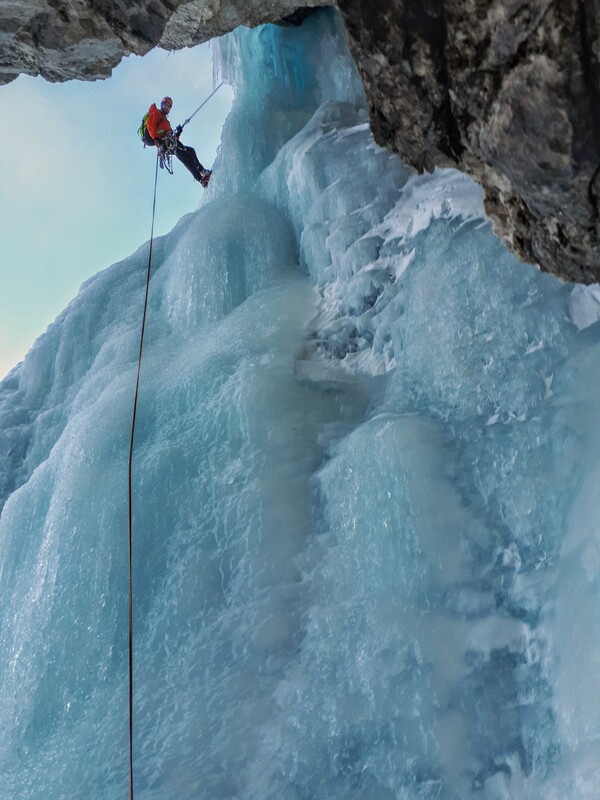 After an initial steep to vertical section above the river, the ice becomes shallower and more stepped leading you to a bolted belay. This rarely formed route represents an advance in climbing at Sottoguda, ushering in the use of bolts to protect climbing. It has mixed climbing with sections of M6. The route climbs an old rock route – you will find some old pegs in place which should be treated with caution owing to the damp nature of the gorge in the summer! Beneath the road bridge you will find the famous Spada nella Roccia. 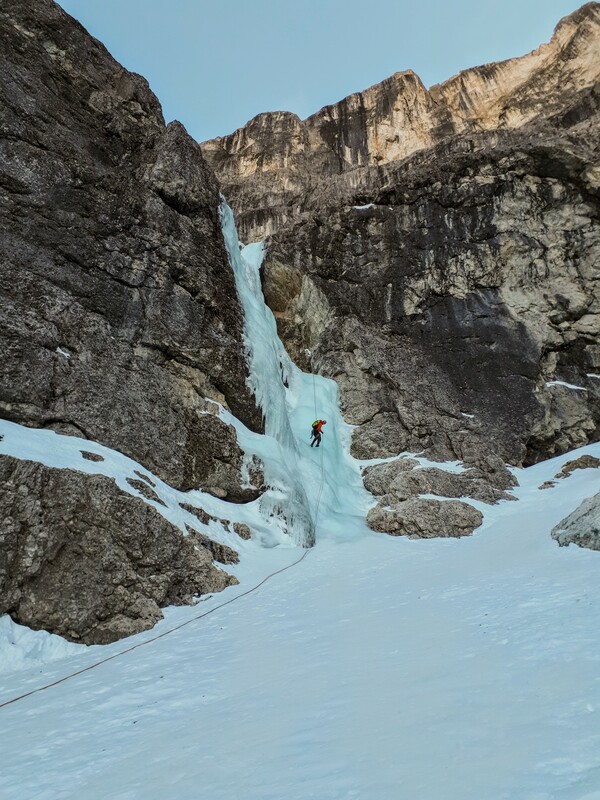 This twin route runs paralell and to the left of the huge column of ice up an obvious corner with sections of hard drytooling and climbing up to M7+. At the end of the route, climb right to the belay of Spada on a ledge. This is a route of national importance and the first ascent during the 80’s represented a major leap forwards as far as Piolet Traction was concerned. As such it is regarded as one of the finest routes in Italy, if not the Alps. Dropping directly from a ledge beneath a road bridge, the route is unremittingly steep, although its nature is often highly featured. 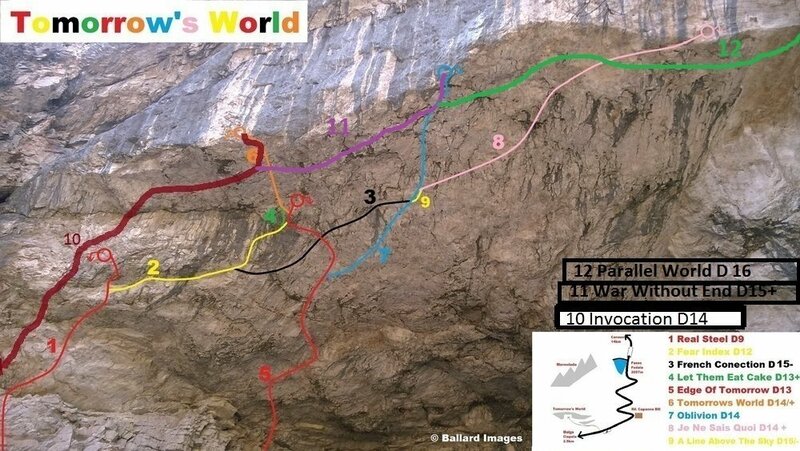 Generally climbed on its right hand side, you will need a full complement of screws to tackle this route. There are three dry routes on the right side of the gorge, currently I don’t have details for them. Strictly speaking this comes after the narrows, where the gorge opens up again into a tall amphitheatre. This route climbs the enormous diedre to the right of the gorge. It only forms in exceptionally good conditions as it is extremely long and requires extended cold and a plentiful supply of water from the slopes above. When it does form though it is a very impressive and imposing feature. The Catedrale is an utterly stunning cascade, so wide that it supports at least 4 independent lines, all of which have first pitches that are frequently climbed in their own right and on many lines, usually dependent on where the boulders are located in the stream bed! All of them are classic and see very regular ascents, with perhaps the exception of “sinistra”, the WI 6 mammoth at the far left side of the falls. Walking up the gorge, the falls are utterly unmistakable as they are simply huge. Before reaching La Catedrale there is a short quite an enclosed line, on the right with the upper section following an almost chimney like section. It’s great as a warm up or for beginners and is slightly awkward which makes it fun! Start in asmall cave and climb up and left to some chains. Several lines possible, with a max of 2 freestanding pillars forming to the right of the falls. Climb WI 4 lines of your choosing to the halfway ledge. In the rock section, you will find at least 2 fixed belay/abseil stations. Then choose between the Right, Central or Left hand lines. All are steep mushroomed ice. The pillars take time to form but are often thick and solid. Be careful with the left hand variant exit as it can be thin in early season. The first pitch attacks the steep central groove of the first tier. The second follows a wide steep wall with relatively few spots to take a break. The left hand variant is usually the last to form as it is an immensely slender column of ice, with intricate, steep climbing. The main upper pitch is a colossal 60m pitch and it’s truly breath taking to watch climbers picking their way up it. The first pitch is also climbed as an ideal beginner’s/warm up route at about WI2+. At the top of this pitch, belay to the left and then climb a steep, mushroomed column to a ledge. Either belay here or continue by traversing the ledge to a final pillar. The falls can be climbed directly to the final pillar which looks to be 4+ or 5. From here on, the routes are a little more spread out so I will describe them as you come to them, starting after the chapel where you cross a bridge. On the left there are two, short hard dry lins, grade unknown. Cross the river and start by a fallen tree. The route climbs up and left to a tree just where the angle of the slope becomes a little shallower. To the right of Kill Bill, this follows a right trending corner and has massively variable amounts depending on the year which affects both difficulty and protectability! On the right there is a bolted dry line which rarely holds any ice. No details of dificulty at this stage. Winter transforms this gushing waterspout into a long, excellent route, and is considered to be the crown jewel of the gorge. The falls have a huge volume of water and so often form a thick column of ice on all the pitches. The first pitch has 2 main lines, left or right of the column whereas the top two pitches are more wall climbing, with the climber choosing their line. Just to the right of Excalibur. This route climbs thin ice up a slab to a cave near the top of the cliff in two pitches. Requires a wet season to form. Often the first 25m of te route are very thin indeed. Equipped belays. Continue up the valley from Excalibur and just before a bridge on the right you will see a small ice fall which starts with a mixed section. An ice hook for this initial section is useful protection as there is no other protection available when the ice is thin. Climb thin bridging moves up a corner and then pull up left onto buried turf. This section requires care. 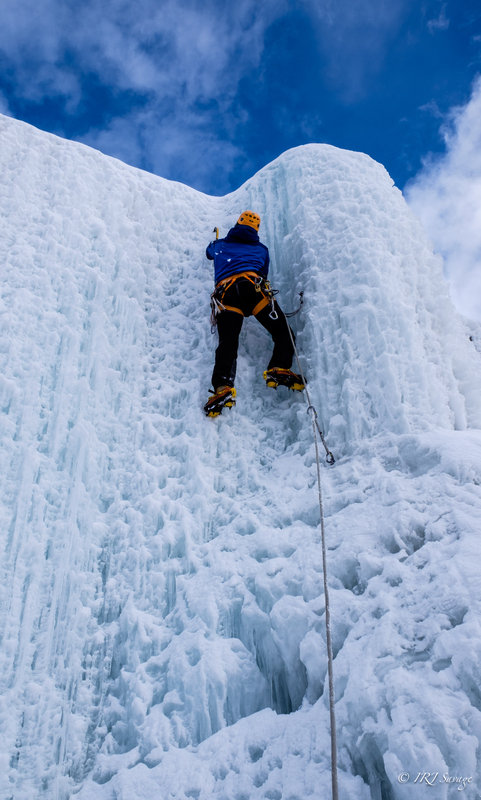 Then climb through a narrow section with increasing volumes of ice to reach a fat icicle. Climb this to a poor bolted and peg belay. Alternatively if you’ve had enough there is usually a piece of tat on a tree to the right just of the ice fall before you commit to the steep ice moves. The belay does require replacement. Follow the valley until you see a relatively new pumping house to the left with information boards. Directly opposite there are some ice falls. Arbre Magique climbs the right hand line. Make a long span to reach over the torrent and climb an initial vertical wall for 10m’s. The angle eases and the route becomes a little stepped before reaching a tree belay. Abseil descent. At the top of the gorge opposite a new pumping house there are some falls. This is the left hand line which weaves it’s way up to a steep step of about 8-10m. There are often hooks and chandeliers here. Surmount the bulge and then move right to a small pillar where you exit to a tree and an abseil descent. This is as far as we know a completely new sector for ice climbing with a large number of worthwhile routes. Access is quick and easy and the routes are of a more traditional nature compared to other routes in the Serrai di Sottoguda – they are mainly in gullies. Park at a car park in Palue, which is obvious and on the left hand side as you go up the valley towards Sottoguda. 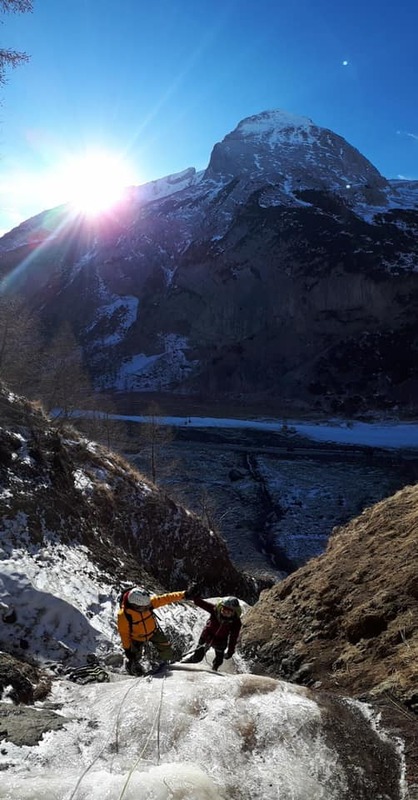 Currently access from near Col di Rocca is not possible as the bridge was washed away during the storm of 29th October 2018. This situation may change in the near future. Cross the river and follow the track east towards 2 large holiday condominiums. When you reach the condominiums start to climb the hillside through the woods towards a deep and obvious canyon marked on Tabacco maps as Ru dei Minieri. After 5 minutes walking through the woods you will approach a stream bed, walk and scramble up this to the mouth of the entrance to the left of the summer climbing crag, L’Ander. Climb the stream bed. From the mouth of the canyon you will enter a large bowl and encounter a short 20m ice fall WI2. This fall becomes banked out after snow and more or less disappears. However under these conditions be careful as the water may still be running beneath the snow. Continue up various smaller steps easily for 150m to reach a longer pitch to the right of an obvious loose yellow cave. This we believe used to be a pirite mine. Climb a 45m pitch WI2+. Now you will reach another large bowl in the valley where you will see other icefalls, manily descending from climbers left. Climb another short pitch and start to climb right towards a stream coming fown from the right. Climb this indirectly at WI 2/2+ fo 50m, or cut the corner up a short vertical wall at 3+. Now cut through the woods diagonally right to find a very faint track to descend. This climbs the first large ice fall on the left in the upper valley. It is very obvious and follows a groove from left to right and then back left. There is a second pitch above at a lower grade and which is less worthwhile. The second ice fall on the left flank of the gully again climbs a right trending groove to a final steep step. 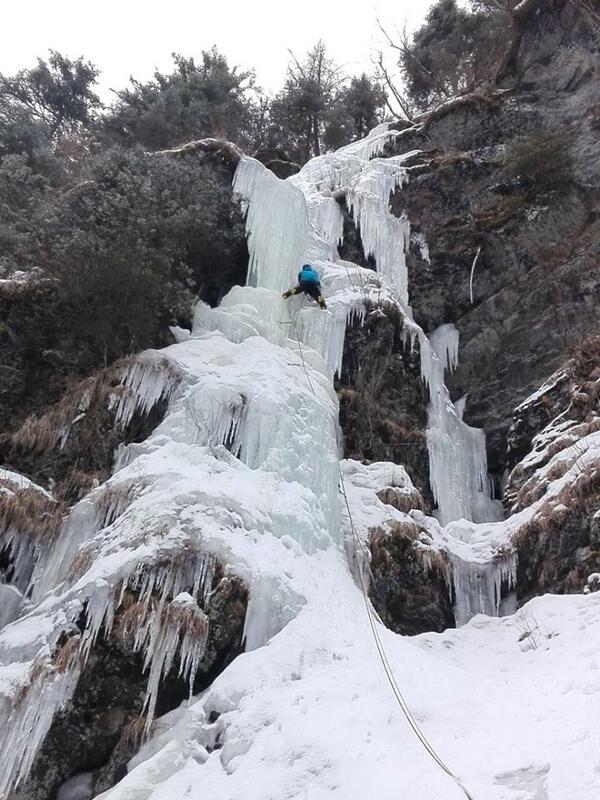 50m after Low Price, climb leftwards directly up to the ice falls. to take a belay at the start of the groove. Potentially you could climb more steeply in a direct line, (WI4?). Above, the stream bed is less steep but can be climbed for it’s full length giving around 150m in total of climbing. At the top you can continue with difficulty through trees to walk down to Ca’Sciota, a small barn and from there return to the valley via a steep short path down through the woods. Or abseil from trees after the first pitch and continue up Prezzi Pazzo. On the upper sections of Crazy Price. Climb Prezzi Pazzo into the upper canyon until you reach the split where the main route climbs right. Now continue up a short steep fall to continue up the canyon into an upper amphitheatre. Here you have three water courses. RIP Crazy Dog follows a line up the middle of the central gully. Start by climbing to a large terrace up a short step and take a screw belay. There is a short easy angled piller to the left of the falls, and then a groove. Climb the groove to a ledge, then continue up directly to the top of the stream bed. To decend abseil from a tree on the right, but be careful under heave snow conditions then your ropes make become stuck due to rope drag in the snow. Or go up through the woods to the right of the stream, then descend into another stream bed and follow the rim of the gorge to rejoin the main path back to the valley. This upper amphitheatre has many possibilities for new routes (between 4 and 6). Please let me know if you climb any of these lines so they can be reported here. Indeed we climbed a line to the right of RIP Crazy Dog on top rope which under good conditions would I expect to be WI4 or 4+. This route climbs a gully to the right of the main Prezzi Pazzo canyon. It’s visible from the road by De Grandi sport in Boscoverde. Start by entering the canyon and when you reach the first bowl, climb up a ramp to the right following a very faint path. When the ramp runs out you will reach a clearing – go steeply up diagonally right until you find the path going through trees. It narrows to pass along a rock terrace and at the end of this you will find yourself in a second gully. Follow the stream with several steep steps up to 75-80 degrees. A really enjoyable climb at the grade. After 4 pitches the gradient becomes shallow and you can climb into the woods to the left. Countour around the mountain to find the path back down the mountain (very faint) to return to the start of the route and then the canyon. When you drive through Boscoverde you will see an ambulance station on the right side of the road. Pull in here and you will be able to see the falls. To reach the falls go over the bridge just down the road near Col di Rocca (at time of writing this is missing – there is a smaller bridge 100m further down the road in Col di Rocca – follow the path back up to meet the road on the far side of the Pettorina) Follo the road to the first shallow stream that crosses the road and a path on the left. Follow the streambed steeply up the hill to the start of the cascade. Climb in 3 pitches, 3+ 20m, 4 20m, 3+ 20m. Marmolada, called the Queen of the Dolomites by the locals, has very little pisted skiing considering her size. The tallest mountains in the range due to her formation from harder Calcarious Limestone and sporting the largest and only notable glacier, it’s the perfect place for Freerie skiing. Easy access due to the three stage lift means that you can have three big offpiste runs in one day, and when the conditions are good, there really is no better place to learn about skiing in a wilder environment. There are a great number of runs you can take, varying in their difficulty, length, ease of return and seriousness. of course there are basically an infinite number of variations, but here I’ve collated the basics together. Please note, the top section of ALL these runs are on a glacier. Therefore you must pay attention to where you are going. It is not the most crevassed of glaciers, but it is still possible to fall in. Generally the further west you are skiing, the more serious the route is, with the furthest east basically being sidecountry riding. Please note – this is an offpiste area in which you should carry all the appropriate equipment – avalanche beacon and probe and a shovel at the minimum preferably an Avalung or Airbag system aswell. It is ILLEGAL to ride offpiste without a beacon and you can be stopped and fined if you do not have one. 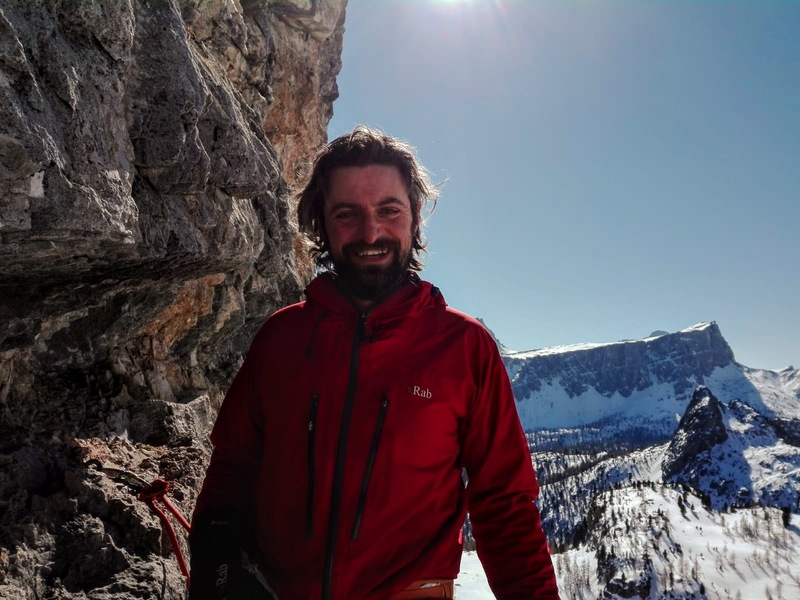 If you are unsure, take an IFMGA guide like Manfred Stuffer or Enrico Geremia – as us and we will put you in contact. Route 1: from second station – used to be groomed as a black run, now left to it’s own devices. Ski beneath Punta Serrauta until you are above Sass de Mul where either you can cut leftwards down a shallow valley back to the piste, or ski right on Route 2 all the way down to near Capanna Bill by the road. The second option can suffer from slabby snow as it catches northerly winds and also at the base there is a section down through small Pine trees (Pino Mugo – look for the Grappa made from it!). Route 3: Take the lift to Punta Rocca and after having gone up to the viewing platform for a minute or two, ski down the piste a few metres until you can ski off the left side and down towards Sass Undici, aiming to it’s righthand side, bewteen the piste and the rock. As you reach Sass Undici there is a steeper slope which drops down the snout of the glacier back to the piste. Here if you have wide skis aor the conditions permit you can continue directly beneath Sass Undici, or take the piste for a little while until you can ski back left to rejoin the direct route, Route 4. This drops you down through a gully towards the reservoir. Make sure you are close to the foot of Sass Unidici as the terrain steepens to the right into small cliffs. Route 5: A Fantastic route which takes the slopes just to the left of Sass Undici in the valley between the former and Sass Dodici. You can ski into the valley in a variety of ways, from the piste like route 3 at a shallower angle or ski down a hanging spur above the glacier and then drop to skier right down a steeper slope where often you can find untracked snow. Once you enter the valley stay right as there is a large flat area in the middle which will require a walk if you go into the middle of it. Once you reach the foot of Sass Undici, the ride gets more interesting again with some great little valleys and re-entrants to play in before scooting hard right, dropping beneath the rock band and rejoining the piste with a short 5 minute walk to Rifugio Fedaia. Route 6: Very similar to route 5 but with a longer walk back unless you have the right conditions. Often less tracked. This time ski towards Sass Dodici and drop into the bowl between the two rocks more steeply. Exit to the left to the Fedaia Dam and walk back to Rifugio Fedaia at the Eastern end of the reservoir or if you are lucky you might be able to ski back towards route 5. Route 7: From the exit of the Gondola station, take route 6 but this time ski left of Sass Dodici, passing directly beneath the rock to rejoin the piste low down the mountain. Walk back to Rigugio Fedaia. 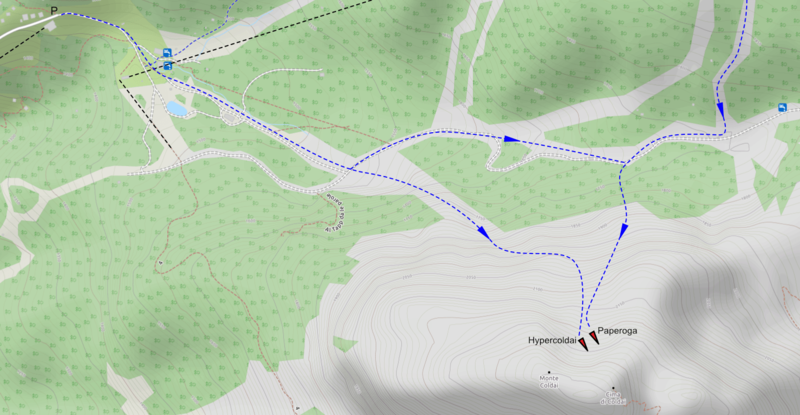 Route 8: Ski directly down towards the Fedaia dam from the station, quite steeply to begin with, 35-40 degrees. This area is potentially crevassed so be careful. Descend towards Rifugio Fiaconi keeping it to your left and then head down the side of Sass Dodici to join route 7 and then the Piste. Walk back to Rifugio Fedaia. Route 9: The last is a fantastic route which takes in the famous Marmolada Canyon. Follow Route 8 but as you reach the lower glacier keep bearing left beneath a rock buttress (which leads above to Punta Penia, the summit of Marmolada). Keep skiing down and left until you ski off the snout of the glacier and into a faint gully. This quickly turns into a very tight, twisting canyon around 4 metres wide and 150m long. Once you’ve passed through the canyon keep descending towards a rock face on your right which often sports a 50m high ice fall. The terrain will funnel you into a steepening and narrowing slope directly below the rock face. You will reach a terrace which crosses the face to your right. In icy conditions you must be exceedingly careful here as one foot wrong could lead to your demise as the slope ends in large cliffs. Traverse back towards the dam – gradually the slope eases off in angle and seriousness. When you reach the dam, walk back to Rifugio Fedaia. This is a great skitour for beginners. The height gain is moderate, the terrain is not steep and the views are some of the best in the Dolomites. On the way you will see Monte Pelmo, Lastoni di Formin, Civetta, Becco di Mezzodi, Monte Cernera and Piz del Corvo. Here’s how to do it. From Casa Alfredino in Col di Rocca, drive to Passo Giau via Colle Santa Lucia (for a scenic but slightly longer route) or Selva di Cadore. After crossing the pass, descend untill you see a sign for Malga Giau. After the next hairpin there is a parking spot. The tour starts directly opposite the parking place. Leave the carpark and skin following the right side of the forest and then beneath steep slopes descending from Col Piombin on the right. After 1km you reach an open bowl from where you can clearly see the line of ascent to Forcella Giau, beneath Lastoni di Formin. Cross the bowl and start to ascend, zigzaging up a 35 degree slope until you are almost level with the pass. Now contour across, gradually gaining height until you reach the pass, after 2.5km and approxmiately 0.45-1hrs. The descent from Forcella Giau is wonderful. Take off your skins and descend the steeper slopes back into the bowl and then very easily back towards the car park in the bottom of the valley. Cut through the woods when it gets too shallow to ski down and rejoin your ascent track.